The blazes are an annual occurrence during the dry season as land is cleared using slash-and-burn methods but they were the worst for years in 2015, with Singapore particularly angered at what it said was Jakarta's failure to take action. The director of the firm did not turn up for the interview with Singaporean authorities despite being served with a legal notice and has since left the city-state, the reports said. The agency did not name the individual or the firm. Singapore is seeking to take legal action under a 2014 law that allows for cross-border prosecutions but Indonesia hit back Monday at the latest move. "We do not agree with this Singaporean idea," Husain Abdullah, spokesman for Vice President Jusuf Kalla, told AFP. "As it happened in Indonesia, it's part of Indonesia's jurisdiction. "If Singapore could easily try Indonesian citizens, it could be a violation of Indonesia's sovereignty." He said that Indonesia had made substantial progress in preparing for this year's fires, with the dry season expected to begin in the coming weeks. 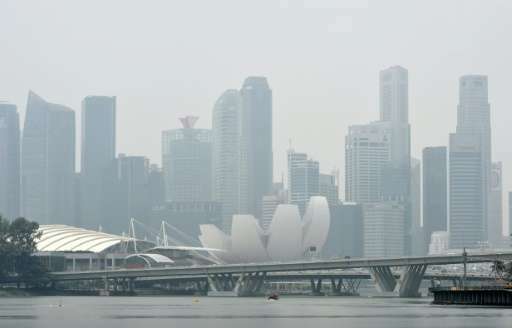 The 2014 law allows Singapore to levy heavy fines on local or foreign companies that contribute to unhealthy levels of haze pollution in the city-state. Singapore has also given notices to six Indonesian-based firms, asking them to explain what they are doing to put out fires on their land.